It's National Caramel Corn Day! I'm not sure if I've discussed this in the pass or not, but I am not a HUGE sweets eater. However, When the mood hits me, I am all about the salty/sweet combo. That's why I ADORE this recipe for Melissa's Homemade Caramel Corn. One of the reasons that I love this recipe so much is because it is a family recipe! Six years ago I got this Christmas Card from my cousin Melissa. We were having our annual baking day at my mom's house and we decided to give this recipe a try (she got one of the cards too). OH.MY.STARS! It was seriously the most delicious caramel corn recipe I have ever tried, and I have been making it ever since. So when I contacted her to make sure it was okay to share her recipe, it because even more special because she told me it was actually a recipe from her Grandma Arnold. I LOVE IT! It's that what recipes are all about? Sharing through the generations. *Prep Time: 15 min. *Cook Time: 1 hour *Difficulty: Easy *Servings: A LOT! Two things before we begin. One, I halved this recipe because Melissa's makes A LOT! This was just for Studhubs and I, so we didn't need that much. Two, if you don't want to pop your own popcorn, you can use microwave popcorn. To begin, place a deep pot or Dutch oven over medium/high heat and add the oil. Place the lid on the pot and allow it to get HOT. Once the pan it hot, add the popcorn kernels. Place the lid back on the pop and watch the magic happen! You will need to shake the pop every few seconds. After about 5 minutes you will have perfectly popped popcorn. Now you can add the peanuts to the popcorn. Now let's move on to the caramel topping. In a sauce pan combine the brown sugar, butter, light corn syrup, and salt. Bring to a boil and let simmer for 5 minutes. Then turn off the heat and add the baking soda. **CAUTION** This will cause the mixture to DOUBLE in size so be prepared! The baking soda makes this caramel topping so light and crisp. I love it! Now pour the caramel topping over the popcorn and peanuts. 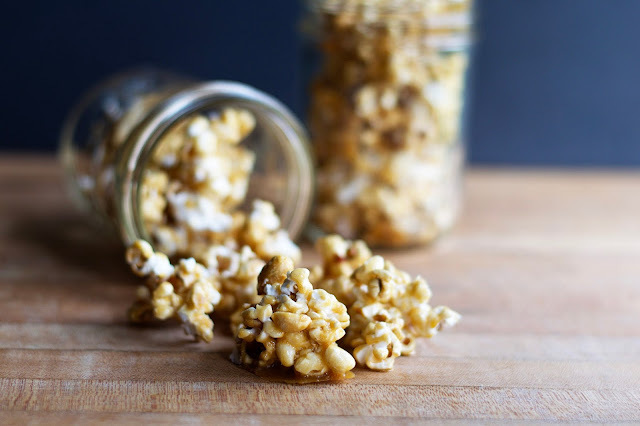 Using a rubber spatula, fold the popcorn into the caramel topping until everything is coated. Seriously...I could just eat this all now, but we're not quite there. 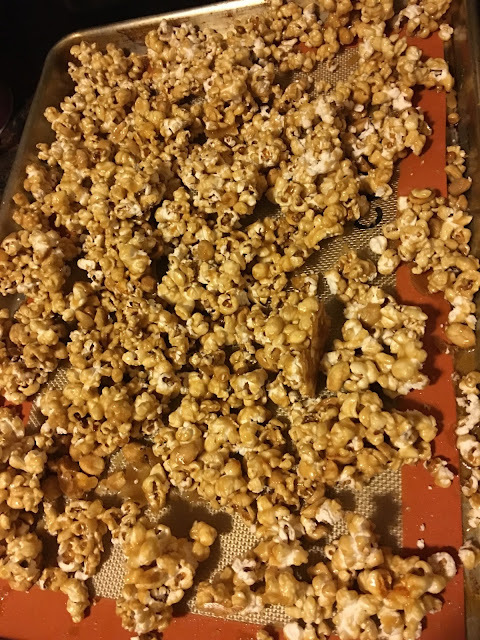 On a foil-lined baking sheet, that has been greased, pour the caramel coated corn out on it, and spread it out in one layer over the baking sheet. Place into the 250 degree oven and cook for one hour, stirring every 15 minutes. Repeat this process every 15 minutes for an hour. After an hour, remove the baking sheet from the oven and let sit for 30 minutes. 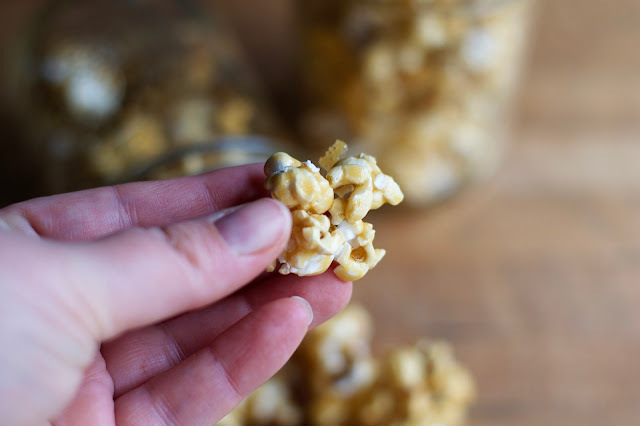 Melissa's Homemade Caramel Corn Recipe is honestly THE BEST caramel corn you will have in your life! And how much fun would this be to make with your kids or a group of friends? Ideal for a gift or a special movie night treat. But who are we kidding? I would eat this on a Wednesday afternoon just because. And with that, I'm going in for a bite! YUM! Salty, sweet, crunchy, light...PERFECTION! 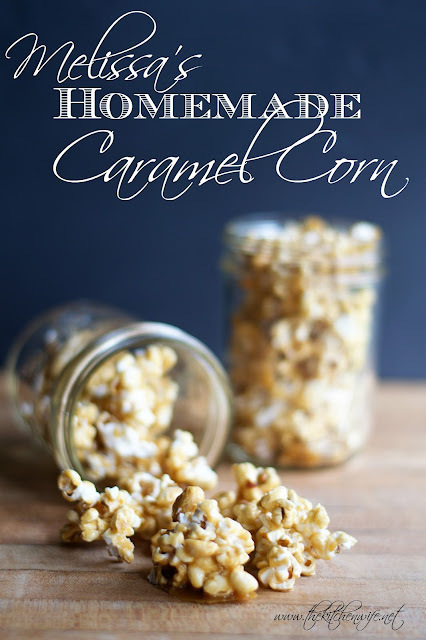 So celebrate National Caramel Corn Day and make Melissa's Homemade Caramel Corn TONIGHT!! Place a deep pot or a dutch oven over medium/high heat, add the oil, and cover. Allow the pot to get hot. Place the lid back on the pop and let the popcorn pop, shaking every few seconds. After about the 5 minutes the popcorn will be finished, and you can add the peanuts. For the caramel topping, combine the brown sugar, butter, light corn syrup, and salt in a sauce pot. Bring to a boil and simmer for 5 minutes, stirring frequently. Pour the caramel topping over the popcorn and peanuts and stir until everything is coated. Next place the caramel coated popcorn onto a foil lined, greased, baking sheet, and spread out into a single layer. Place into the oven and bake for 1 hour, stirring every 15 minutes. Remove from the oven and let cool on wax paper for 30 minutes. * Feel free to use microwave popcorn. **The Caramel will DOUBLE in size at this stage. Beautiful post Mandee. This is the best caramel corn too isn't it!!! I have eaten it a lot but never made it. Thank you for sharing this. I still have my Christmas card with the recipe too. Thanks so much Pam! And yes! It really is the best I've ever had! Made this without the peanuts. It is amazing! YAY! I'm so glad it turned out well for you!! !